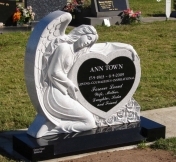 Central Coast Memorials offers a complete range of memorials including markers plaques headstones and full monuments. Click on "Memorial Options" or "Photo Galleries" to see some of our memorials and options. 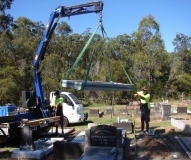 We service all cemeteries on the Central Coast including Point Clare, Wamberal, Noraville, Jilliby, Ronkana, Yarramalong Ourimbah as well as cemeteries in Lake Macquarie, The Hunter and Mid North Coast areas. Free DVD. For family members who do not have access to the Internet we can send them a free DVD to assist them with their memorial selections. Recommended. 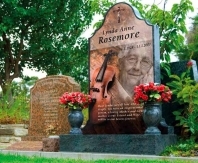 Central Coast Memorials are recommended by Funeral Directors on the Central Coast for our integrity reliability performance and value for money. Monumental Masons Central Coast, Monumental masons Point Clare cemetery, Monumental mason Wamberal Cemetery, monumental masons Noraville cemetery, Monumental masons Jilliby cemetery, Headstones Central Coast, Headstones Point Clare cemetery, headstones Wamberal cemetery, headstones Noraville cemetery, headstones Gosford cemeteries, Tombstones Central Coast,Wyee Cemetery, Belmont Cemetery, Sandgate Cemetery, funerals, headstones Gosford Cemeteries, monuments Central Coast, monuments Point Clare cemetery, Monuments Wamberal Cemetery, Monuments Noraville cemetery, memorials Point Clare Cemetery, memorials Wamberal Cemetery, memorials Noraville Cemetery, funeral director links, Jilliby cemetery, Holy Cross cemetery, buy memorials, sell memorials, NSW heastones, inscriptions Bronze Plaques, Central Coast headstones, NSW memorials, buy headstones, sell headstones, Headstones for sale. Grave site memorials, grave site markers, gravesite headstones, gravesite monuments, gravesite plaques.